Your catcher’s bag should have enough space so that you can put your mitts, helmets, cleats, bats, and other gears. To carry the bag easily, I also suggest you buy a bag with wheels. What is the best catcher’s bag in 2019? 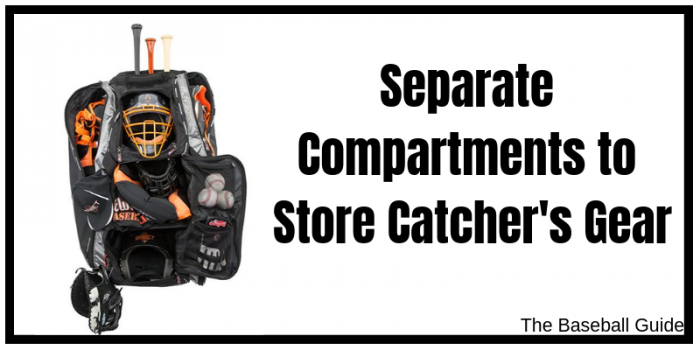 In this article, I’ve shared each and everything that you’ll need to know before buying your ultimate catcher’s backpack. To make a quick decision, you can also read this short section. WHAT EQUIPMENTS DO YOU WANT TO STORE? When it comes to buying the best catcher’s bag, then two names came to my mind; No Error No E2 Catcher’s Bag and Bownet The Commander Catcher’s Bag. After doing the research, I can say that my number one recommendation will be Bownet The Commander Catcher’s Bag. The appearance of The Commander Bag is better than No Error No E2. In The Commander, there are 14 different pockets where you can pack all your catcher’s gear, and keep them separated based on your personal preference. There is a specially designed molded semi-hard separate section for the helmets & cleats. There is a special section to store 3 full-size big barrel bats. 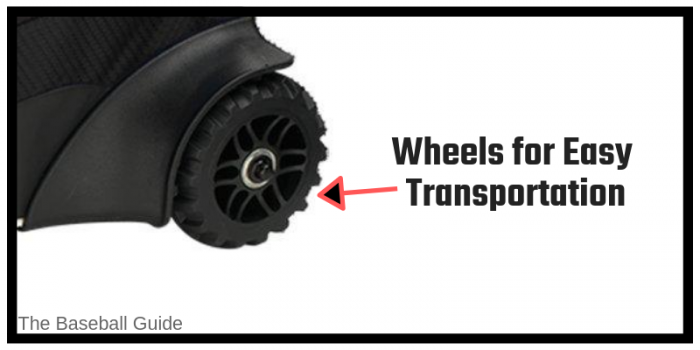 The high-quality Big Trax Wheels helps you to easily transport it on any type of surface. It has sufficient space for all your catcher’s gear and you’ll never regret your decision. Can You Store the entire Catcher’s Gear in Bownet Commander Bag? Yes, watch this very short video to see how. It’s always a challenge to cram everything into your catchers’ gear bag which is why you should be careful while selecting them initially. Based upon the equipment that you have at your disposal; the size factor comes into the picture. Leg Guards and multiple other accessories. As the player progresses through the ranks and into the professional level, the size criteria come into the fray into a much-increased level than necessary. Many of the MLB Level players keep that in mind when they choose what they need in terms of space for their catchers’ bag. Are the zippers maintained for rugged use; since it would be the same all the time? Does the bag contain any inline wheels for easier use and comfort; if yes, then check the wheel quality. Whether they are designed to take into harsh terrains like grasses and gravel, and so on. Does the product contain the additional layers of polyester to effectively insulate it from adverse effects and other uncontrolled conditions? Are there inner pockets; if yes then check their condition. Also, check for safes meant for keeping your personal and valuable possessions like wallets, and whether they are resistant to scratches. A catcher should always be agile, alert and fit when he is on the field to marshal his players towards victory. It would be ill luck if some of the notable catchers like Johnny Bench or Roy Campanella or Bill Dickey were to break their backs just because they had a baseball catchers’ gear bag with no wheels. 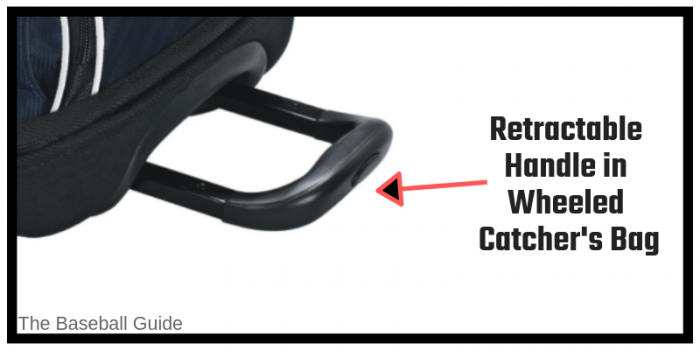 The situation might seem hilarious to some but the question remains as to whether you should have an alternative for having a wheeled catcher’s bag. The answer moves toward the positive side, and there is no question about it. Bags nowadays come with customized and rugged wheelsets with additional rubber threading so that it can bare harsh problems with much ease. Some of the additional features also include elevated wheels that give the player an advantage of carrying the bag around without having to bend over it continuously. Think carefully before proceeding forward with your choices. This is another great feature of the catchers’ gear bag. Having separate compartments for every one of your tools is a great asset to have since that would help you to avoid unnecessary hastiness. The main advantage of having this inside your bag would be that they can arrange everything as per their order so that later on they don’t need to worry about it. Separate sections are always designed for cleats, mitts, balls and other gears which makes it a lot easier for access. Some of the models are designed so that the players would find it suitable. There are distributions wherein the main one is always big that holds the major gear sets. The top compartment is always standard for the catchers’ helmet. The bottom one can be used to keep your cleats since many of the brands also provide sufficient ventilation in there to keep them fresh. Before going in for the price margins, you should check whether you have the pre-requisites fulfilled i.e. the points that are mentioned above. 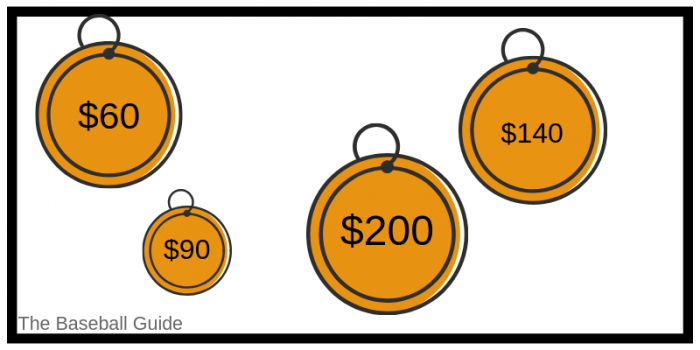 Have you checked everything with respect to the quality, and are you willing to spend a little bit more for a good product than the cheap one? Quality should always come first, and it holds true whilst buying the catchers’ gear bag as well. Some of the well-known brands like Easton, The Commander’s and so on rate their bags at close to $200. This is an understandably great estimate if you have looked into everything and are spending it accordingly. Fiddling around with cheap brands which don’t fulfill the criteria would only leave you in a precarious position. The result would mostly include dinted wheels, cheap quality material, chipped off compartments, etc., which would be enough to make you worry. Rate the bags from marginal to best in terms of price and then purchase them. A catchers’ role in the field is the most vital. He steers the game, marshals his troops in the right direction. With enough experience, he would be able to drive the game the way he wants to. That is what a catcher does, and he is, therefore, an integral part of the team. Apart from his in-field role, he should also be having the equipment that provides him with the comfort of the game with minimum hassles. Apart from the gear that he needs to wear throughout the game, he needs to have the perfect gear-based catchers’ bag to store his arms. The wheel-based catchers’ gear bag also consists of a retractable handle that provides comfort to the players, and it is a valuable addition to it. Rugged zips that surround your bag are just as vital since you use it thoroughly, the bigger they are, the more congenial it would be to use it. With respect to how big your bag and how much weight it can ideally support, it also consists of inbuilt hooks which enable you to hang them anywhere that you wish to. You can also hang other accessories and items like your water bottles, sunglasses, and other items in customized pockets. The bags also consist of personalized team name panels to identify yourself with. It’s a great addition to have if you are taking an order in bulk. Some of these features should also be taken into consideration when you are scrounging for the perfect catchers’ kit bag for the novices and the professionals. It keeps you aware of the major things that you can check as per the requirements that you have. Youth catchers’ bags are also becoming a range for the players who are taking part in little league tournaments and championships. So even they can check what they need by taking into account the list of features that would prove vital in the long run. If you are getting ready for your game, and you are the catcher then it is absolutely important that you are in top shape. More important than that is that you should have your gear ready for lock and load so that you don’t fret around your bag later on. MITTS –A catcher needs to have something solid in your hand which is where the mitts come in. It has webbings, provides support and a good amount of protection to prevent any and all kind of damage. MASKS –A catcher needs to have a mask at all times for protection from the batter and the pitcher. It should be handy and easily removable when you have to pursue the ball. CHEST PROTECTORS – His strongest armor that is made up of durable foam and mesh-based substance to protect and ventilate the player as well. 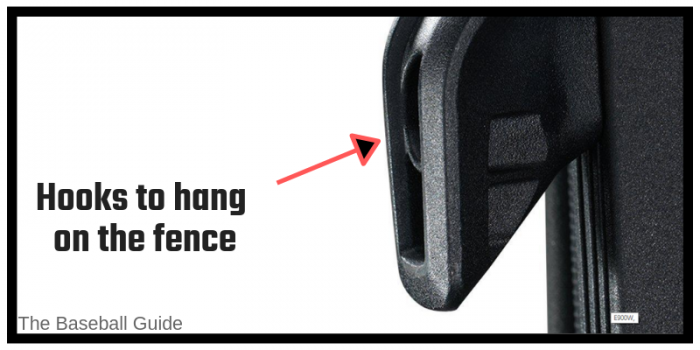 LEG GUARDS –You should be protecting the lower part of your body as well which is where the leg guards come in. They cover your body from the cleat to your knee and it also consists of padding for comfort. NO errors NO E2 Catchers bag is a baseball equipment bag which is equipped with nine pockets and compartments with three that are well ventilated in helping you keep your wet items dry. It has 36” long x 12” deep on the inner locker part of the bag. It has a 36 x12” wide x 12” deep shin guard pocket which will expend you to accommodate knee savers. There are also two 16” long x 12” wide x 4 deep pockets on the other side. It is made of heavy-duty fabrics thus providing you with the best material. It has a shelving system, expandable shin guard pocket and heavy-duty cleat pocket which will help you perfectly in storing all your equipment. It has plenty of space for your essentials in order to keep it handy. This catcher gear bag will provide you with enough room to hold up to three baseball bats, all of a catcher’s essential gear, in addition, it also has a place for batting and catcher’s helmets. This will help you to keep all the equipment in an organized way. It can get access to everything in seconds as its four hideaway hooks will enable and help you to hang it anywhere according to your requirement. 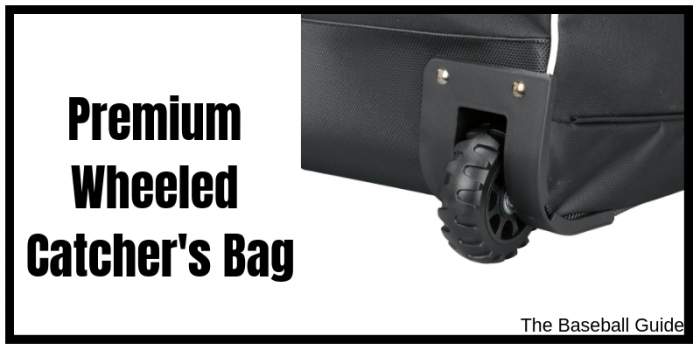 It can roll anywhere with ease as the wheeled design will let you easily handle the gear bag. 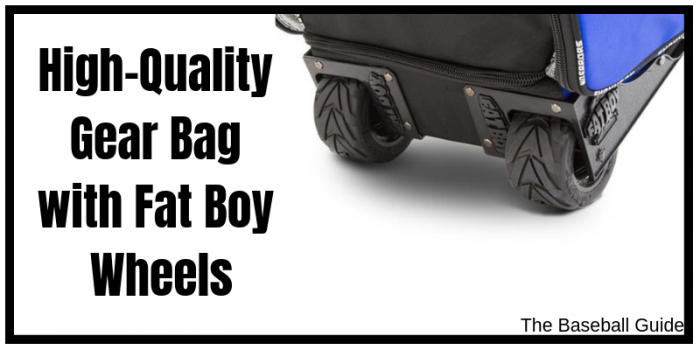 This bag has fat boy wheels which have heavy-duty treads that will allow the catcher’s bag to simply move over the grass, dirt and any concrete base with equal ease. This will provide you ease to roll the bag over any of the rough areas. It has a built tough for travel. This bag is built to outlast. It is made with heavy-duty materials and reinforced stitching which will help you resist rips and tears. So, the material will help this bag to last long. All these qualities make this bag a bit expensive. It can be said that this catcher bag has a plenty of space which will help you in carrying all your necessities. It can roll the bag anywhere with ease which will help you in carrying the bag easily with wheels. The bag is built to last long and can be said that is durable. As the material used is durable, it comes with a little extra cost. Easton E700 W Wheeled bag is made from T420D hex ripstop 600D polyester. The dimensions of the bag are 36″L x 13″W x 13″H. Full Bottom Rail in the bag helps in adding structure and durability to the bottom of the bag. This helps the bag to be durable. It has heavy duty inline wheels which are rugged for excellent mobility. So, you can move your bag easily from one place to another. It has massive lockable zippers which will help to provide the maximum durability to prevent blowouts. There are 3 different color options available from which you can choose. It does not have any hooks to hang it on the fence. Though, it is spacious enough to store catcher’s gear, batting helmet, 3 gloves and 3-4 bats. There is no separate compartment for an individual bat. 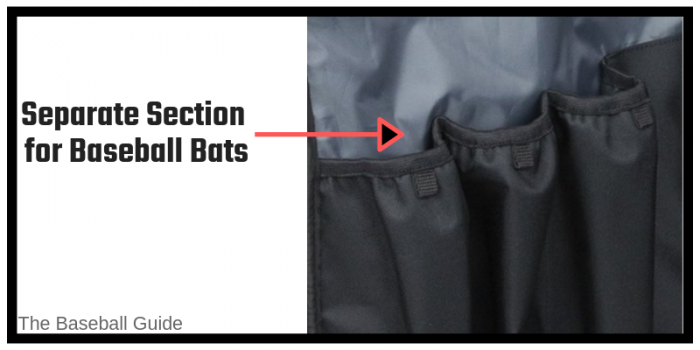 Though, 3-4 bats can be stored in a single compartment which is specially made for bats. It is an affordable bag with wheels which means you don’t have to spend a lot but will still get the best material. So, it can be perfect for high school players and catchers. Easton E700W Wheeled Bag is a bag which is considered as spacious, durable and affordable. It also has excellent mobility. It also has 3 color options from which you can choose. It also has a full bottom rail which helps in the bag to have a proper structure. But, there are no hooks to attach the bag to the net and no separate compartment for an individual bat. Though, it can be considered as one of the best and perfect bag with wheels for high school players and catchers. Boombah Brute Rolling Baseball/Softball Bat bag is made from Dark Charcoal/Orange Heavy Duty Nylon Rip Stop & 600 100% D Polyester. The dimensions of this roller bag are 35″L x 15″W x 12.5″T. It is a high-quality bag that is very resistant to rips or tears. It also has heavy duty zippers. It is made from durable material which helps in providing the quality to the bag. The bag is constructed in such a way that the top compartment helps in keeping the dirt away from getting on other items in your bag. It has a large bottom compartment which will allow easy carrying of shoes or helmets. There is a large main compartment of the bag which is designed to carry anything from the catcher equipment, glove, balls, helmet etc. This will help you in proper storage of any equipment you require to store. It has one handle on each end which provides the bag to lift it in and out of the vehicle. 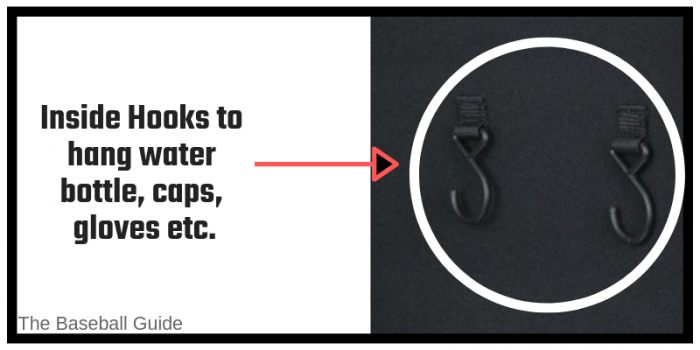 It has re-enforced J-hooks which makes it easy to hang the bag anywhere you require. It has large wheels which allow it to roll over anything possible. You can easily roll through any rough area. It has plastic runners on the bottom of the bag which rather adds stability. There are a lot of colors options from which you can choose. 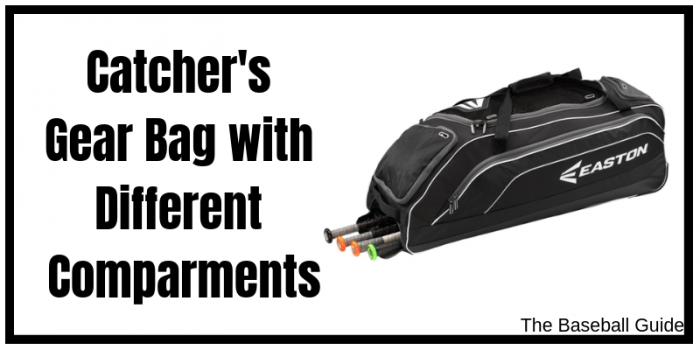 It is an affordable catcher’s gear bag. Boombah Brute Rolling Baseball/Softball Bat bag is affordable and has a durable material. It also has large compartments in order to store various equipment. 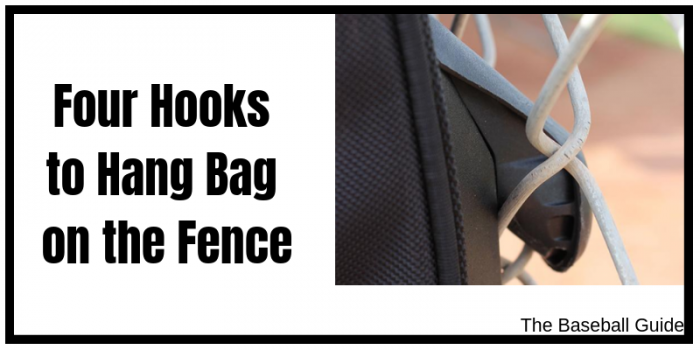 It has plastic runners which provide the bag to run over any rough areas and also has J-hooks which provide the hook to be easily hung anywhere on the fence. It has a variety of colors to choose from. This bag can be your choice if you want to buy an affordable bag with all the necessities. Rawlings Sporting Goods Yadi Wheeled Catcher’s Bag will help you store all your gear. This will help you to focus on the game. It is made from durable material which will help it into last long. The product dimensions are 37 x 14 x 6 inches. It has exterior pockets which help you in keeping the things. It has an extra large main compartment in which you can store all your essentials without any worries. It has a removable panel which can be used for customization. It has a telescopic pull handle which will allow you to easily pull your bag. It has large wheels with reinforced support base which will provide you in easily dragging the bag. But, this bag is available in only one color i.e. black. This bag is an affordable deal for the buyer. Rawlings Sporting Goods Yadi Wheeled Catcher’s Bag is a durable bag equipped with the reinforced support base. It also has a removable panel for customization. Though it is available in only one color but is affordable with the best material provided. Under Armour Professional wheeled catcher’s bag is a large, reinforced and rolling duffel bag. The dimensions of the bag are 5.5 x 11.5 x 35.5 inches. It has 5 inner sections which will perfectly fit the catcher’s gear and 1 outer compartment which can fit up to 4 bats. It has integrated skid rails which help in providing tear protection. It will provide it durability. It has an anti-sag wrap around the plastic plate. It has wheels which help in proper rolling the bag on any dry and rough areas. Though, it is available in only black color. But this bag is considered to be affordable. It is considered as one of the best catcher’s bag with wheels for high school baseball players. Under Armour Professional Wheeled Catcher’s Bag is an affordable and durable bag. It has anti-sag wrap around the plastic plate. It also has wheels which will help in providing the bag to travel from any of the rough areas. Though, the bag is available in only black color. But, still is considered one of the best choices. The Mizuno Samurai is a popular bag that is used by baseball and softball catchers to store their gear. It looks small, but it has plenty of space with separate compartments that can be used to store catcher’s stuff like cleats, batting and catching helmet, mitts, and other protective gear. With the help of high-quality wheels, you can easily transport it to the field. There are 4 different color options from which you can choose your desired one. The price is also reasonable, and you’ll not regret on your choice. The best baseball catchers bag with help should be durable and of high quality. You should get the bag with the best wheels as the wheels will help you in properly dragging the bag from one place to another. There can be a sometimes rough area by which you have to stroll down your bag, so, assure the quality of the wheels to be the best. Though you should buy the most affordable bag which fits within your budget and also provides you with the best material. It can be concluded that you should buy the best bag according to your needs.